Just wanted to shoot you a few lines about the next few days! 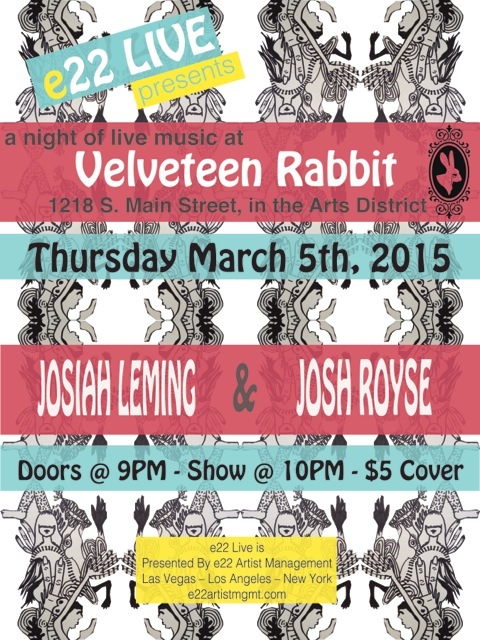 We have a show tomorrow, Thursday, March 5, with two very talented acts: Josiah Leming, as well as Josh Royse. Doors open at 9 and show starts at 10. It’s on the patio, so bring a light jacket! We have a couple heaters, but prepare to be outside :)) $5 cover! As always, we will be doing a special, limited menu on First Friday, so our brand new Spring Menu will NOT be available. DJ Aurajin on Saturday bringing you a little more of that Get Back flavah! Come for great tunes and amazing drinks. Our Spring Menu is now available! Come drink them all!